The secret ingredient for this creamy 100% dairy free sauce, is, would you believe … cashews! Packed full of healthy protein and fat, when soaked over-night they form the base of this incredibly rich, dreamy, creamy non-dairy, and intensely mushroomy sauce. It’s not just a pasta sauce, pour it over chicken breasts, white fish, even steamed veggies. Add a little extra water and it makes a mega-moreish mushroom soup. Cook the pasta in a large saucepan of boiling salted water according to packet instructions or until al dente. While the pasta cooks, heat a large non-stick frying pan, add the olive oil over a medium-high heat. Add the mushrooms and one of the garlic cloves and cook, stirring occasionally, until they are brown, about 15 minutes. 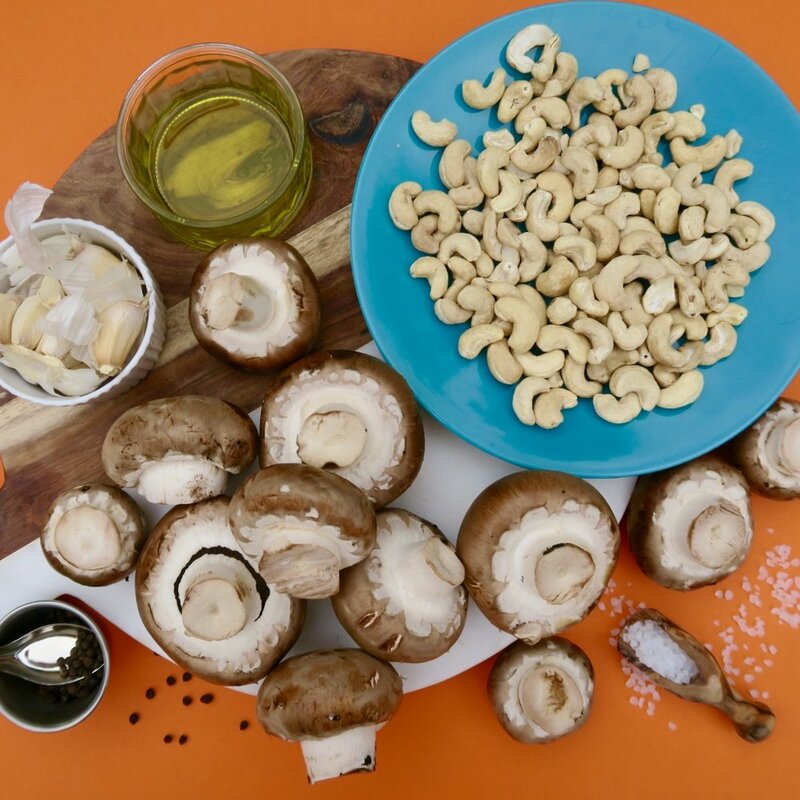 Add the soaked cashews, remaining garlic, sea salt, black pepper, 375 ml of water and a scoop of the cooked mushrooms to a food processor, or blender and blitz on high until smooth. Check and adjust seasoning to your taste. Pour the sauce into the pan with the rest of the mushrooms. Bring the sauce to the boil. Transfer the drained pasta to the sauce, adding a little of the pasta water if you want to lighten the sauce.